It’s almost that time again for our monthly branch meeting. We are looking forward to having our first crime writer up to talk to the Leacock/Simcoe group. 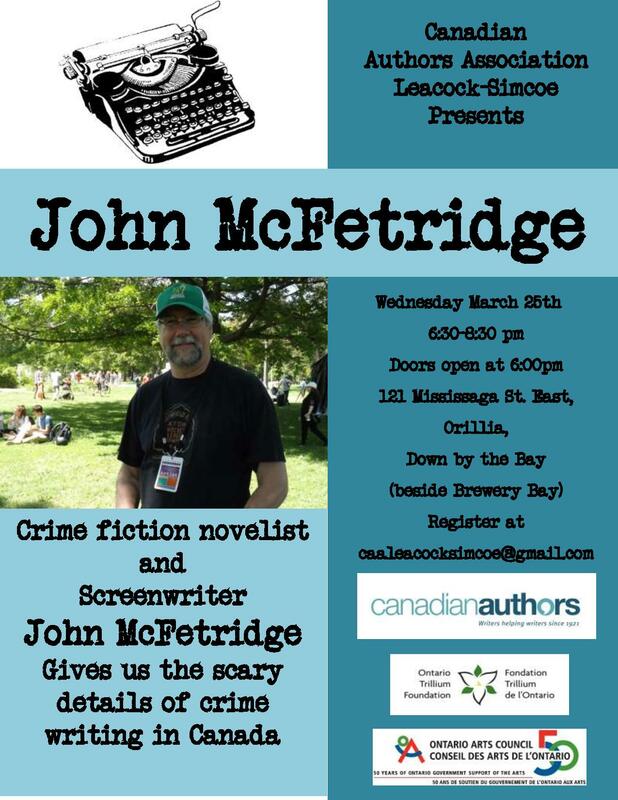 Crime novelist and screenwriter, John McFetridge, will talk about the crime writing genre in Canada as well as what it takes to write mystery and crime into your novel. Our Writers Helping Writers segment this month will focus on writing your second draft and having the perseverance to keep going. Please note that this month the meeting will take place on the last Wednesday of the month, the 25th, rather than the Thursday. It is a temporary change and meeting dates will go back to the last Thursday of the month in April. Please see the attached poster for details. Categories: CAA Events, speaker | Tags: caa, Canadian Authors Association, crime fiction, mystery novel | Permalink. Writers, are you clear on how to show not tell in your writing? Let Sharon Clare help at February’s Canadian Authors’ Association meeting. Come join us tomorrow night’s meeting at 6:30 in Orillia at Down by the Bay on Mississauga St. Check out the poster for more details. Categories: CAA Events, Meetings, speaker | Tags: caa, orillia, show vs tell, writer | Permalink.